For many homeowners, a new year is the perfect time to wrap up a honey-do list and reorganize sections of their home. In doing so, some find that it’s time to add on to their living space or update an existing indoor or outdoor area. Fortunately, there’s no shortage of staircase designs and inspirations when it comes to a home remodeling project. 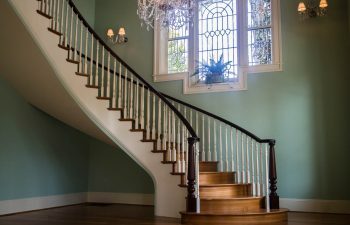 From a grand staircase to a warm traditional or modern-industrial style, Southern Staircase/Artistic Stairs has developed a trusted reputation for high quality craftsmanship and skill as a staircase manufacturer for 30+ years. Perhaps the most important thing to remember when adding a staircase to a remodeling project is that the staircase is more than a conduit to other spaces in the home. Similarly, the staircase is not simply about function—each component (railings, lighting, color) combines to translate the unique style of a home or space. Consider the flooring of a staircase. Carpeted stairs, whether fully carpeted or covered with a carpet runner, add warmth and comfort to a space. Moreover, they keep noise levels to a minimum and provide an important safety component in the event that a person falls. On the other hand, the beauty of plain hardwood staircases is undeniable, not to mention the fact that they require very little maintenance and do not trap odors. Even so, if you’re one with the minimalist trend, a floating or cantilevered staircase with custom lighting creates a simple, clean illusion, where designers might opt to omit the riser altogether. Given an example, a glass wall may serve as a guardrail on one side, while a slender handrail is placed on the other. Interestingly, while this type of staircase lacks structure, it makes more of a statement with the way in which it “floats.” Furthermore, given the evolution of staircase designs in recent years, the blending of seemingly contrasting materials such as wood, metal and glass allows builders to flex their design muscles in fulfilling the unique needs of homeowners. In the same way, changing one detail of design makes all the difference, as in the case of stairs suspended by steel cables. If you are considering a home remodeling project and would like to add a staircase or bring an existing one to life, the talented craftsmen at Southern Staircase/Artistic Stairs welcome the opportunity to work with you. Once a concept is born, our team embraces the challenge of constructing unique staircases or all designs and styles, using various materials. From start to finish, you’ll find that our talented team is fully equipped to construct and install with a turnkey process and dependability. To get started, call the innovative experts at Southern Staircase/Artistic Stairs today.